I'm re-publishing on this topic because, well, it's just that important. I'd like to discuss what I call camouflage ingredients and landmark ingredients. With the knowledge of these 2 important ingredient types, you'll know if you're holding a jar of gold... or toxic sludge. It's not such a bad thing necessarily. It's a good thing that companies protect their formulas, after all, if they created it, they should have a right to profit from it and keep others from copying them. However, this is not the most truthful representation of the product's contents. There's no way to know exactly the proportion of ingredients in a product, but you can get clues from what I call LANDMARK INGREDIENTS! These are ingredients that are almost always used in certain amounts. By seeing where they are listed on a label, you can get a feel for the amount present of the other ingredients in the list. 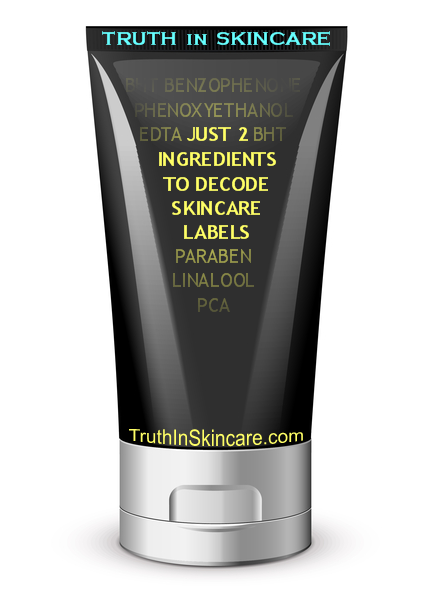 Please note, this is also assuming that the labels are honest and follow FDA guidelines! Unfortunately there are plenty of incorrectly marked labels out there. If you see any labels that are a little odd, feel free to email me an example! We may go over the product here on TRUTH in SKINCARE. KNOW THESE LANDMARKS:Anti-oxidants, Vitamins, Preservatives. Here is what this means: Find any of these ingredients and you know you are in the ~1% area. (Usually much less for BHT, EDTA, Vit A). In fact, many of these ingredients will be present in less than 1% in the product. And if there are more than one or two of these in the list, you are almost guaranteed to be in the less than 1% territory. this isn't meant to cast doubt on all product labels, but for you, as a consumer, to be aware of certain practices within the industry. Every company wants their product to sell, and consumers are more aware than ever. They tend to focus on the product's ingredient list to market their product as well (hey, most consumers look at the ingredients in their product before they buy!). So a snazzy list of 25 organic extracts seems wonderful to most consumers looking for natural or organic ingredients. And remember my rule from before? My rule that states, that it "Once an ingredient proves, not to be effective, but to be a hot seller, then the vast majority of the market will follow." Well, you can expand this to a list of ingredients or types of ingredients (like organic). also, quick question; are the labello made by nivea?